HOT OFF THE PRESS -- Available after five years of playtesting and development, the GUTSHOT CORE RULE BOOK made its national debut at OwlCon XXIV in Houston, Texas. 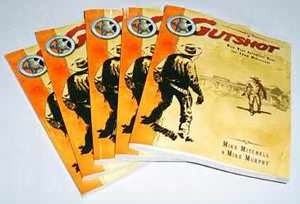 The dust has settled on the 24th annual OwlCon and the Gutshot Posse is still catching its breath after a very successful weekend which featured the long-awaited national release of the company's flagship product, the Gutshot Core Rule Book. The gaming convention was held Feb. 4-6 at Rice University in Houston, Texas. Although it competed with both the Super Bowl and Mardi Gras, this year’s convention had the second highest attendance on record with more than 450 people. Game co-creator Mike Murphy was on-hand to share in the product’s national debut. This was his first time attending OwlCon (he had previously lived in Las Vegas, Nevada), but is an old hand at attending other game cons and commented more than once on how well organized things were at Rice University. Mitchell also said he was amazed at the energy level and enthusiasm people had for the two demo games he ran over the weekend. On Saturday, and again on Sunday, Mitchell ran a simple scenario called “Last Man Standing.” The game is a simple scenario where everyone fights everyone else to the death – the winner is the last one alive. The energy level actually pulled in a lot of observers who wanted to see what the ruckus was. The high energy, the hard work, and the fun were all worth it, the partners said, but the long weekend took its toll. Both Mitchell and Murphy are working on longer convention reports, including news about prize winners and the game reports for the two demo games. In the meantime, check out this Photo Gallery of convention highlights.